Services — Orpheus Piano Co. The bulk of our work involves piano tuning and repair. We also provide services such as evaluations, humidifier and practice felt installation, and more. We specialize in piano tuning and repair. Our team is dedicated to improving the three primary aspects of the piano experience - tune, touch, and tone. Visit the below categories to learn more about what we can do for your piano. We also offer additional services such as evaluations, installations of humidifiers and practice felts, cleanings and much more. View our rates on our booking page. Pianos require tuning more frequently than any other service. Your piano should be tuned at least every 6 months - ideally this occurs with the changing of the seasons. A good rule of thumb is to schedule tunings two weeks after the heat turns on/off. Pianos also require tuning after moving. Wait two weeks for your piano to acclimate to its new home, then contact us to reserve an appointment! If your piano has drifted too far from concert pitch, it will require a preparatory rough tuning called a pitch adjustment before it will be able to hold a fine tuning. This is necessary when a piano is 7 cents +/- concert pitch, generally after more than a year without tuning, or a significant ambient humidity change. Just as important as your piano's sound is its feel. Each mechanical component of your instrument needs to be periodically adjusted, and sometimes repaired, to ensure optimal functioning. 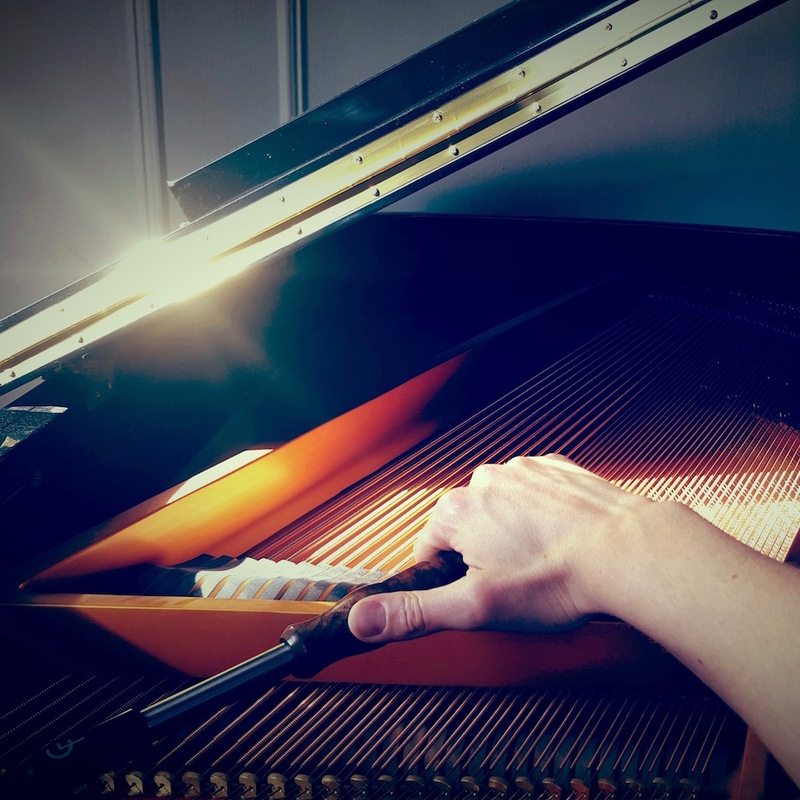 The ultimate aim of the piano technician is to make sure your piano is a “transparent vehicle for musical expression" – meaning there are no malfunctioning mechanics or distracting sensations when your fingers contact the keys. We can make targeted adjustments and repairs on an as needed basis. Rates for repairs depend on the specific situation, but our technicians have hourly rates that serve as a basic guideline. If any necessary repairs come up during your appointment we'll review them with you first. In some cases, regulation - complete adjustment of the piano's mechanisms - may be necessary or desirable. Contact us to discuss your needs and budget, and we'll work together to develop the perfect approach for your piano. Voicing is the process of optimizing the timbre of your piano. Among numerous other factors, it involves softening or hardening the felt of your hammers to soften or brighten the tone. If you're interested in voicing, first set up a tuning appointment - after tuning your piano we'll be able to accurately assess its voicing needs and provide you a quote.